Just a couple of months back we had a wonderful experience at Tai Lei Loi Kei in Macau. It was one of the best food experiences that we had in our trip to Hong Kong and Macau. They had the juiciest and most succulent pork chop that perfectly complemented their polo bun. For our Singaporean readers, the good news is that there is a Tai Lei Loi Kei Singapore branch! They opened at NEX shopping mall at Serangoon back on 20 December 2014. As promised, we went down on a weekend to have a look at the place and the first thing that you would notice is the full house. 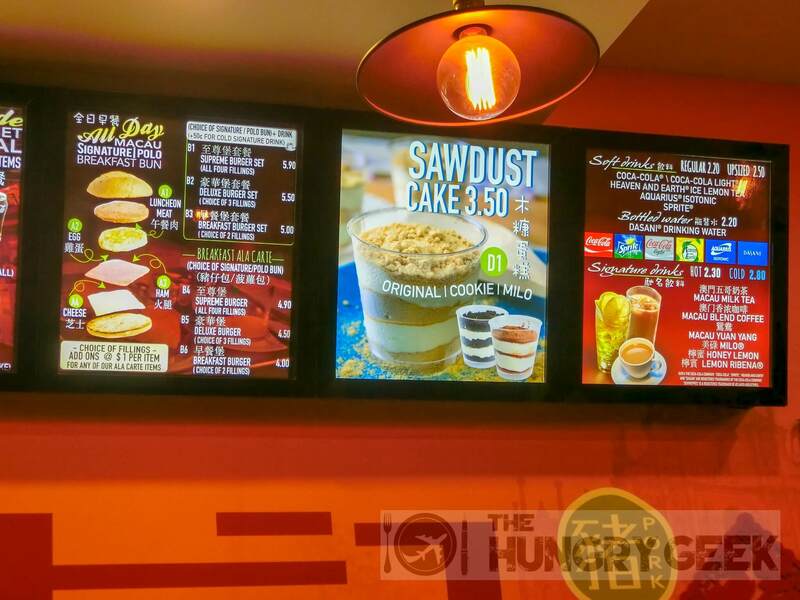 Unlike their main branch in Macau that has more of a cha chaan teng or coffee shop feel, the air conditioned outlet in Singapore gives the feeling of a cross between a cafe and a fast food joint. You order and pay at the counter with overhead menus resembling those found at fast food outlets. They give you a tag number, and they will serve the food to your table when ready. 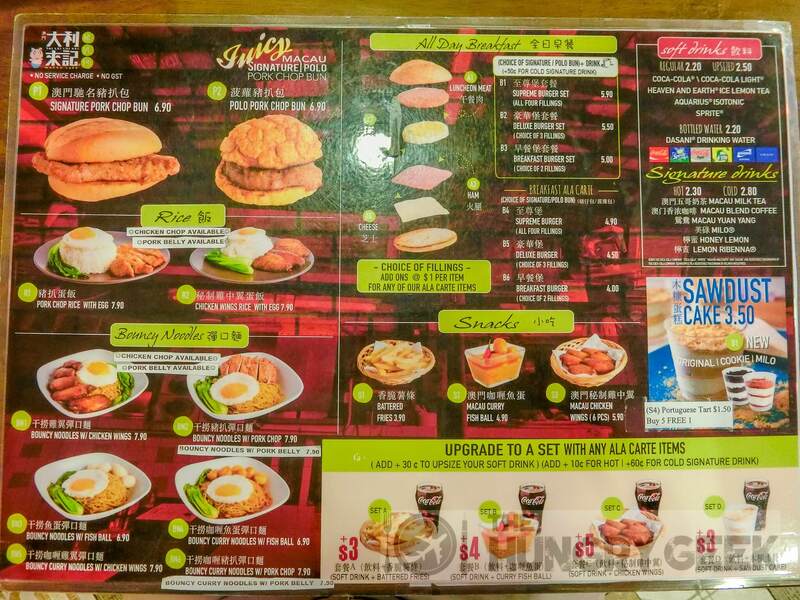 We noticed something very interesting from the menu – there are much more customisation options available here at the Singapore branch! 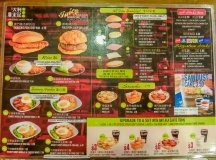 You can add luncheon meat, egg, ham or cheese to your bun at S$1 per item under their ‘All Day Breakfast’ menu. We did not see this option at their Macau branch. This was our top pick in Macau and no surprise, this is our favourite item here at Tai Lei Loi Kei Singapore too! You will not find anything similar to this in Singapore, with the soft the mildly crispy polo bun going very well with the pork chop. The pork chop inside the bun was served piping hot, and it was perfectly made. It was juicy and tender with a solid taste. We found it a bit odd that they provided tomato and chilli sauce when we didn’t remember being given those in Macau. However, when we took a bite, it made sense. The polo pork chop bun in Singapore tastes a bit different from the Macau version. The polo bun is a bit firmer and the pork chop had a slightly different taste. Adding chilli or tomato sauce would greatly enhance the taste in this instance – we recommend that you try the bun without any sauce, and then add some and decide for yourself which is better. 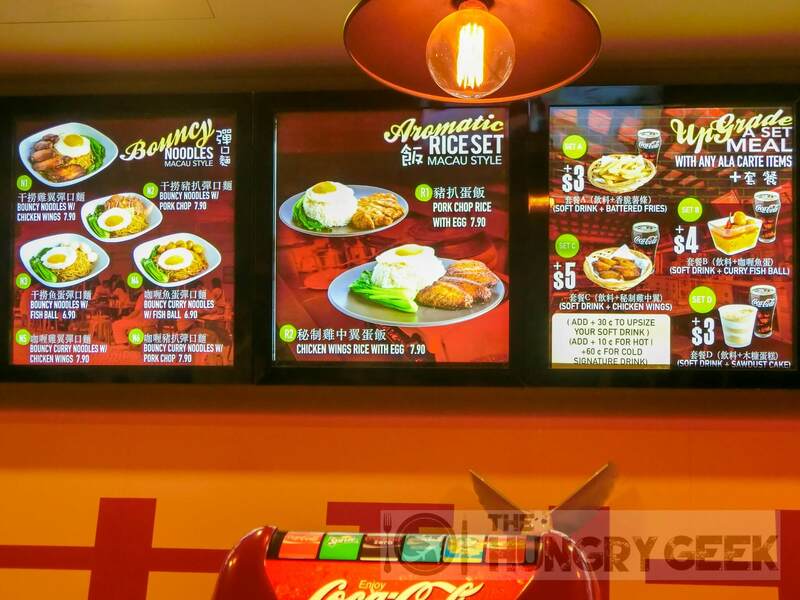 We rate their polo pork chop bun 4/5, and it will set you back S$6.90. We suspect that this bun would have tasted much better together with some of their ‘All Day Breakfast’ customisations – personally for me if I had a time machine I would have added some egg and cheese. As with our Macau review, we shall call this their toasted pork chop bun. The Singapore version that we tried has a far superior crispy toasted bun. It was toasted perfectly to just the right crispiness, and this was surprisingly much better than the one that we had in Macau. Perhaps we got an unlucky bun in their Macau branch but it speaks to their consistency. The combination of their pork chop and the toasted bun is solid as well, but we recommend that you try using their sauce condiments to enhance the taste. We rate their toasted pork chop bun 3.8/5 and it will set you back S$6.90. Again, I wish that I had added some egg and cheese to this bun. We bought this item out of curiosity. They had an interesting set option with curry fish balls, so we decided to give their ala carte noodle version a try. This was an agonising decision as the choice was between pork chop rice or noodles and this. But as we already had two pork chop items we decided to give their curry fish balls a try. The dish was solid, with strong fragrant curry and springy noodles. Perhaps not completely al dente, but it would be hard to tell as it was soaked in curry. The serving of fish balls was generous, you do get six pieces, an egg and vegetables. We rate this dish 3.8/5 and it will set you back S$6.90. 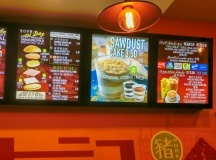 This is their original flavour Sawdust Cake. It has the same concept as tiramisu, with biscuit crumble and cream. We rate this 3.8/5. The Macau owners seem to have held a bit back when they opened the Singapore branch. However, I must commend the Singapore franchise managers for making do with what they were given and introducing new concepts and innovations that were not present in Macau. They have a better toasted bun, and their customisations allowing the addition of luncheon meat, egg, ham and cheese really stirs up some interesting combinations. We would definitely come back here to try their other selections. If you go to NEX often, you must try Tai Lei Loi Kei Singapore!